At Wakefield Country Day School, courtesy is an important part of education. The school’s handbook includes twenty traditional courtesies, and all students in grades 1-12 review the “WCDS Courtesies” at the beginning of each year. 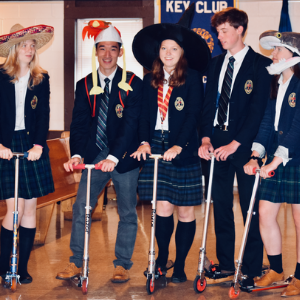 To set a serious but fun tone to the study of manners, members of the senior class perform comical courtesy skits on stage during the first few weekly assemblies. The seniors, as leaders of the student body, write scripts, prepare costumes, gather props, and dramatize the “right way” and “wrong way” for students to behave in the classroom, on the playing field, in the lunch room, and in the community at large. Students observe conventional rules of etiquette when eating to help make the lunch room a pleasant environment for everyone. Of course, the “wrong way” of doing all of the above garnered the most laughs from students and teachers, but in the end, the skits showing the “right way” of doing things gained the most nods and applause. On the first day of school, fifth grade students at WCDS practice standing in unison to greet adult visitors entering their classroom. As with any type of learning, skills and understanding develop at different rates in students, and the manners learned at a younger age can become more formal and refined in the teenage years. During the WCDS Senior Life Skills Week, a springtime series of lessons imparted to the graduating class to help prepare them for the next phase of their lives, seniors attend an etiquette session hosted by Susan Dryden Whitson, WCDS parent and former Press Secretary to First Lady Laura Bush. At this presentation and luncheon, in between stories of lavish state dinners and glamorous galas, Whitson shares proper dining etiquette with the class while explaining traditional table settings—including how to remember which fork to use when. While some may consider the school’s attention to manners to be rather old-fashioned, students and staff at the school take that critique in stride (as shown by the humorous courtesy skits) and know that beneath the “pomp and circumstance” there’s a really good reason for learning polite, attentive behavior: it’s an important first step in the classical approach to education. When a community sets expectations for courteous behavior, students learn that courteous citizens can better communicate with one another. Students see that effective communication cultivates a deeper understanding of ideas and events, past and present, and they realize that a better understanding of different views fosters a richer learning experience for all. 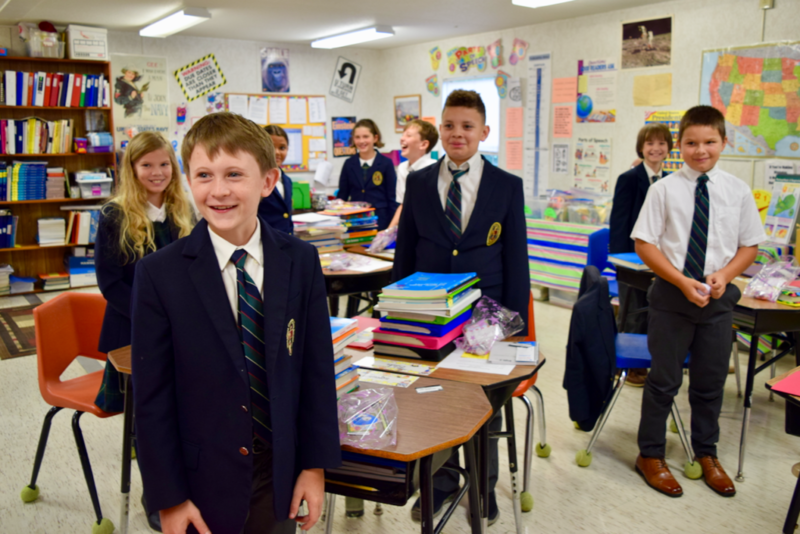 WCDS Admissions Director Lisa Cieplak has been a parent at the school for thirteen years, working the past ten years in the admissions office, and she finds many people are impressed by the school’s old-fashioned approach to good manners. 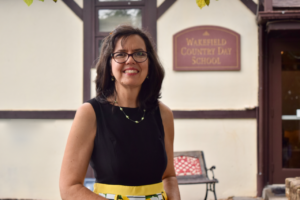 “When I talk about the courtesies to parents,” Cieplak relates, “they find it refreshing and rare that a school would put such emphasis on these things.” And while Cieplak values the positive reaction from prospective parents, she too knows there’s more to manners than meets the eye. Indeed, courtesy is an important part of a Wakefield Country Day School education.